Access your accounts, transfer balances and deposit checks 24/7 on your smart phone or tablet. We make managing your money simple and easy! Learn about the abundance of features our mobile banking offers, and get started on effectively managing your money from the palm of your hand! Each mobile device functions in a different way. Access the user guide specific to your device to learn how to use our mobile banking. Below are a list of frequently asked questions related to AmeriChoice Mobile Banking. If you don’t find an answer to what you’re looking for, be sure to also check out the user guides above. If you still have questions, please contact a Member Service Representative at 717-697-3474. What is AmeriChoice FCU's Mobile Banking? 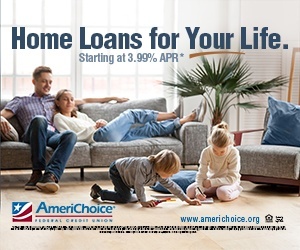 AmeriChoice FCU’s Mobile Banking enables you to connect to your AmeriChoice FCU accounts from your mobile phone or tablet. You will be able to easily access your balance information, transfer funds, make a deposit or even find a branch or ATM. 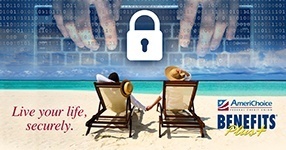 AmeriChoice FCU’s Mobile Banking provides access to most of your AmeriChoice FCU accounts. First mortgages and Student Loans accounts are not available through Mobile Banking. Some account features, such as a VISA credit card history are not available through the mobile app. Please note that the Mobile Deposit feature is only available with iPhone, iPad and Android devices. The service is FREE- AmeriChoice FCU does not charge a fee for Mobile Banking. However, your mobile carrier may charge you standard fees for Internet access. For more information about these fees, please contact your carrier directly. Mobile banking is currently supported on iPhone, iPad and Android/Droid devices. 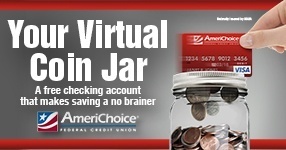 You can start using Mobile Banking if you are currently enrolled in AmeriChoice FCU’s Online Banking. If you are not enrolled in Online Banking yet and would like to begin using mobile banking, click on the link below, call a Member Service Representative at 717-697-3474 option 0, or stop by the branch nearest you. You will have three Mobile Banking options available to you. You can use our mobile website or you can download our app to your phone. You can also sign up for text (SMS) banking. See below for more. Visit our website on your mobile device and log in through the Online Banking log on link. For security purposes, the first time you log in you will be prompted to check your email for a one-time PIN to register your device. To use our Mobile App, download the AmeriChoice Mobile Banking app through the Apple Store or Google Play Store. For security purposes, the first time you log in you will be prompted to check your email for a one-time PIN to register your device. Is the Mobile Banking app available for the iPhone? Yes, our Mobile Banking app is available for iPhone and iPad! If you are signed up for Online Banking, download the app from the Apple Store. Once downloaded, you’ll see our logo’d app for access to Mobile Banking. For security purposes, the first time you log into the app, you will be prompted to check your email for a one-time PIN to register your device. Change your Online Banking password immediately since it is also used for mobile banking. Report the loss of your phone to your mobile carrier and ask that they disable the old phone. As always, whenever there is a possibility of unauthorized access to your account, you should watch your account closely to ensure no unauthorized transactions occur. Can I use AmeriChoice's electronic bill payment on my phone? Yes, Electronic Bill Payment is available through Mobile Banking. You are able to pay an existing payee and review any upcoming payments. For security purposes, you are not able to add new payees through Mobile Banking. Full bill payment capabilities are available through Online Banking. If I do not have a data plan on my phone, can I still use Mobile Banking? Yes. You can access text banking (text messaging charges may apply from your phone carrier depending on your plan). For more information and/or to enroll in Text Banking, please view our User Guides. Can I make a VISA payment through Mobile Banking? Yes, simply transfer the funds to your VISA payment account listed on your mobile device. Then, at the end of our business day, the funds are applied to your VISA. If you have an AmeriChoice VISA and no VISA payment account appears in your list of accounts, please contact our VISA coordinator at 717-697-3474 x3524 to have it set up for you.